In order for the process of design and construction to run smoothly, we highly recommend our clients to employ our services in all stages, from finding the perfect plot, getting the approval, to moving into a new a home. 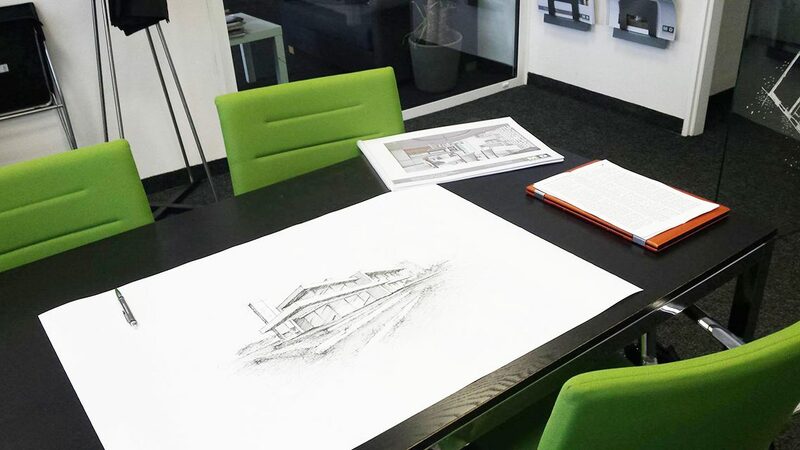 During the opening meeting, our team will provide you with advice regarding the entire process, such as the suitability of the desired land or house, the time frames and the cost of the building plan, along with the needed materials and technologies. This meeting is consultative. The advice offered during this meeting are not binding and are free of charge. We will employ our expertise to help you find the land suitable for the planned project. Our experts will assess the plots' surrounding and orientation. Based on the assessment, we would advise you about the conditions defined in the zoning plan and warn you about possible complications that might arise regarding the infrastructure or the easements etc. We will determine the buildings basic features, its size, examine its complexity and evaluate its related investment. According to this examination, we are able to present a concrete bid with detailed explanation on every step of the process. If the client is content with the bid, an agreement will be held on the extent of the provided services and signed so we can start working on designing your home. If you have already purchased your plot, we need to study the zoning plan carefully before we start with design. Zoning plan usually determines many conditions and restrictions for new buildings. We also need several technical documents like geodetic measurement and utilities. During this stage, we would offer you a consultation about the attributes of your future home. Our architects would develop the concept design, which would allow to materialize your dreams about the house. We would discuss in detail your demands and gradually convert them into a final proposal, taking on board functional and practical considerations, and respecting the financial plan. The concept design is followed by a detailed design, where we would determine the materials and technologies needed to construct the house. This leads to completion of the architectural study. As a part of architectural study, we would also provide you with photorealistic visualizations in order to materialize the concept of the house and see how it would fit into its surroundings. The same design process would be applied to the interior, so that the whole house design would be completed in a harmonic complex. At this stage we are going to build on the architectural study and begin to work on the various stages of the project and dealing with permits and formalities necessary for construction. The project documentation is processed as several sub-parts (various stages of the project). Each stage has its own purpose and scope. and documentation for building construction. At this stage we also help with arranging all the documents necessary for construction, including building permit. We call this activity engineering. But engineering activities includes much more. There are many other documents, permits and observations needed before claiming the building permit. Our targer is clear. To create perfect home where you would feel like nowhere else in the world. With all knowledge we acquired we know that there are just two options to finish your project. Either we would construct your house or supervise external building company.